A story about surviving one of NSW's flooding rivers. Mary Groves and William Douglass arrived in Australia on the First Fleet in 1788. They were both convicted in Lincoln, England and sentenced to seven years transportation to the new colony; William for stealing a silver watch and Mary for stealing 13 guineas in gold and 8 shillings and 6 pence in silver. They faced some of the most difficult years of the colony in New South Wales; the threat of starvation and beginning life anew in a place that couldn’t have been more different from the cobbled streets of Lincoln. Mary and William were married on the first day of June, 1788, with the permission of the Governor (Arthur Phillip). In 1794 they were chosen to be part of a group of 22 families to be settled on the banks of the Hawkesbury river, at Pitt Town Bottoms, so must have shown the authorities that they were prepared to work hard, not only for their own sakes, but also for the good of the colony, which was relying on these new farmers to supply food for the growing town of Sydney. Perhaps if William and Mary had known the challenges they would face in that place, they might have had second thoughts. For a couple of pickpockets from the city of Lincoln in England, growing wheat and corn on 30 acres the banks of a river, from scratch, must have been a mammoth task. While Governors, military and naval leaders, and free settlers fought to feather their own nests and maintain control of decisions in the growing colony, settlers like Mary and William Douglass fought for survival. It was soon clear to these struggling farmers that they would face severe flooding of the river year after year. After the first couple of years the 30 acres they had been assigned was reduced to 15 acres as the banks of the river repeatedly claimed their soil, destroyed their crops and washed away their huts. When William and Mary’s daughter, Elizabeth, was born in 1796, they might have been tempted to surrender their land altogether and move on, as some did, too despondent and heart-broken to continue. But the Douglass family fought on. The worst floods were recorded from 1799, when the river rose over fifteen metres. Twelve months later, in March of 1800 it rose over 12 meters. For any who have been to Windsor (then called Green Hills) and seen the markings which show the height of the flooded river, it isn’t hard to imagine what it must have been like for those who had to watch all they had gained and worked for, washed away. When the rains came, after the summer heat, the dry land around the banks of the Hawkesbury would succumb first to the torrents that rose with shocking speed and began to flow across the fields. Newly delivered Government stores were often washed away. Hogs and goats would be seen swimming for their lives, struggling to stay out of the swirls that were carrying them downstream. It’s reported that stacks of wheat covered with poultry could be seen being swept swiftly away. The water would rise up around huts and barns until only the roofs of some were visible. Boats were dragged sideways as men struggled to steer them, trying to reach the disappearing banks to rescue women and children. Amid the roar of the terrifying, swirling waters, shouts and gunshots would be heard from settlers who were signaling for help, some trapped on the roofs of their huts or on tree branches. Those who were fortunate may have had time to pack a few basics, put some tools in their cart, and find an escape route to the higher ground of Green Hills. When the rain subsided they would be looking down from the ridge on a huge lake of muddy water, choked with the remains of their livelihoods. The most courageous and persistent would decide to rebuild what had been swallowed by the waters and replant whatever crops were deluged. Mary and William were among those who battled on, salvaging what they could and starting again, hopefully learning as they went that the river could not be ignored, nor was it to be tamed. 1806 was a terrible year for floods, with the river rising nearly fifteen meters in March, then over fourteen meters in August and again over nine feet in October. In the first twenty-four hours of the flooding in March more than two hundred men, women and children were rescued from the tops of houses and trees where they’d hung for hours, screaming for help, despairing of their lives and expecting any minute to be swept to their deaths. Such was the speed of the rising waters, that many had woken that morning with water lapping to the edge of their beds. By nightfall, hardly a building below Green Hills could be seen. The river resembled a sea, spreading below the high point of Green Hills for as far as anyone could see. Women and children huddled in dry corners of the three-storied building which was the school house and government offices, frantic that their husbands and fathers might be lost in their attempts to help others. The story was told of the Chalker family who’d tried to escape by a boat which had overturned in the torrent. Only Chalker and his five-year-old boy had survived. There were also stories of miraculous escapes. One settler, his wife and two children were carried nearly seven miles down river from their farm on a barley mower before being picked up by a farmer. Samuel Marsden, the resident clergyman, sent word to Parramatta about the devastation and four days later over one hundred labourers from the Public Works at Parramatta and Castle Hill were sent under an overseer, together with twenty-seven volunteer soldiers, with orders from Governor King to give every assistance in saving as much wheat and maize as possible. Men, women and children worked for days on the flats around the river banks, dragging out what of their belongings could be saved and as the water receded settlers made their way back to their devastated plots to rebuild. All this, only to be repeated twice more in that year. It seems at that stage even Governor King’s lost hope, as he gave a directive, saying that the likelihood of further flooding around Pitt Town Bottoms was such that those who wanted to continue farming should consider moving to higher, forested lands, like that around Toongabbie, Parramatta, Prospect Hill, Castle Hill or Seven Hills. It seems that there were Officers from the Corp and their friends ready to take advantage of the settlers’ suffering; offering to buy the farms for next to nothing. Some farmers were told they could stay on and work for the Officers if they were prepared to be paid in liquor. Some farmers were discouraged enough to accept it these offers. Some were no longer able to keep the farms up themselves and had nowhere else to go. What was known about the Rum Corps in those early days, presents a shameful aspect of the early settlement. Some hopeful change to the way things were run in colony came with Captain William Bligh, who became Governor in late 1806 and tried to put a stop to some of the rogue practices of the military men. He seemed more able to deal with men like John Macarthur, men focussed on their own prospering. Governor Bligh acquired some of the land on the edge of the ridge above the Hawkesbury, set up a model farm and put a young man called Andrew Thompson in as overseer. He prohibited the exchange of spirits for grain, food, clothes. This encouraged some of the small farmers to stick at it and learn how to farm more wisely and plan around the flooding. Of course this set Bligh at odds with men like Macarthur and began a long running battle between the two, in and out of the Criminal Courts, Macarthur accusing Bligh of breaking codes of practice and sending letters to England, complaining about him and saying that the Home Office needed to investigate. By 1808 the Corps has declared martial law again, under the direction of John Macarthur. Governor Bligh was virtually deposed and under house arrest. No doubt this spelled trouble for the small farmers. In May and then again in August of 1809, when the river flooded to almost 15 meters, the farmers were again at its mercy. 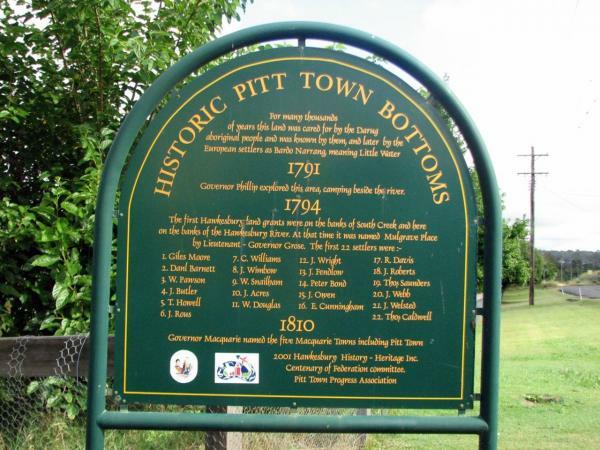 The hero of that year in Pitt Town Bottoms was the young man, Andrew Thompson, who had been assigned as overseer of Bligh’s farm. He is reported to have been out night after night in his small boat rescuing people from tree tops and roof tops. The water had come up so quickly, about four feet an hour, that many people had no time to escape. Women and children were lifted off floating pieces of roof and stacks of barley, while pigs floundered around them, Lives were lost when some roofs didn’t hold until help arrived. But Andrew Thompson went back and forth through the swirling waters, to the church building on Green Hills, where survivors were being fed. The cleanup after the floods went on for days, with over a hundred workers arriving from other settlements to help with the clearing and resowing of the land. It was estimated that losses from the May and August floods that year were over two thousand bushels of wheat, a thousand bushels of maize, four hundred bushels of barley, three hundred acres of maize, nearly seven hundred pigs and as many sheep and goats. But the cost was even higher for Andrew Thompson, who became ill with fevers after having been drenched for nearly three days rescuing people on both occasions. It was an illness he would not recover from. He continued to have bouts of fevers thereafter and it seemed his lungs were permanently damaged. He was a man in his mid-thirties, who had never had a family of his own, but had given his life helping others. For his bravery the new Governor, Lachlan Macquarie appointed him Justice of the Peace and Chief Magistrate of the District of the Hawkesbury, a position he held for only a short time. When he died in October, 1810 a plague was laid at St Matthew’s Church in Windsor, in his honour. The words give him appropriate recognition. …. a native of Scotland. Sent at the age of seventeen. From the time of his arrival he distinguished himself by the most persevering industry and diligence, having raised himself to a state of respectability and affluence which enabled him to indulge the generosity of his nature in assisting his fellow creatures in distress, particularly in the calamitous floods around the Hawkesbury in the years 1806 and 1809 when at the risk of his life and health he exerted himself over three successive days and nights in saving the lives and properties of numbers who but for him must have perished. In consequence of Andrew Thompson’s good conduct Governor Macquarie appointed him a Justice of the Peace. This most useful and valuable man closed his earthly career on the twenty second of October in this year of 1810.